Previously, I said this series of posts wouldn’t be about the easy cases, the specimens you can photogrammetrize if you’ve got the brain of an amoeba an a cell phone camera from 1995. So remember: sometimes, much less effort is required than the description below seems to suggest. I still don’t intend to cover such easy cases, but there are helpful tools and tricks that can make harder tasks almost as easy. These are the requirements for objects you can place on a turntable, the latter being on of the greatest time-savers for photogrammetry that exists. “Turntable” in the sense of “swivel” or “Lazy Susan”, by the way, not “record player”! It is nice to have a powered, computer controlled one if you want to use a laser scanner one, but for photogrammetry a hand-powered one is totally sufficient. There are plenty of heavy-duty turntables our there, some of them quite expensive. In my experience, you better get a cheap one (or two or three), available via e.g. Amazon for less than $ 25. Toss them when there’s grit in the turning mechanism; it is cheaper and you can transport the light ones easier, too. Up to ~50 kg they can cost as little as $ 5, free shipping in the US. I paid € 11 for mine. Knowing I wouldn’t need very sturdy ones I bought plastic ones, but if you expect to put sharp-edged stuff on your, buy some with a sturdy cover. Usually, these are called “heavy-duty”. So, where’s the turntable? you ask. It is below the newspaper, and as for WHY it is below the newspaper – patience, young Padawan! The next step, once you have your specimen on the turntable, is to set up the camera. On a tripod! Initially, you should set up the tripod so that the camera is slightly below the specimen and that the vertical extension at the top of the tripod is all the way down. If your tripod doesn’t have this feature, tough luck! It will later mean more tripod-handling than necessary.Here’s a photo of one of those easier cases, showing the tripod set-up. Instead of a turntable I simply used a sandbox, which I manually rotated, because the bones (oviraptor tail vertebrae) were so small that no turntable was necessary. 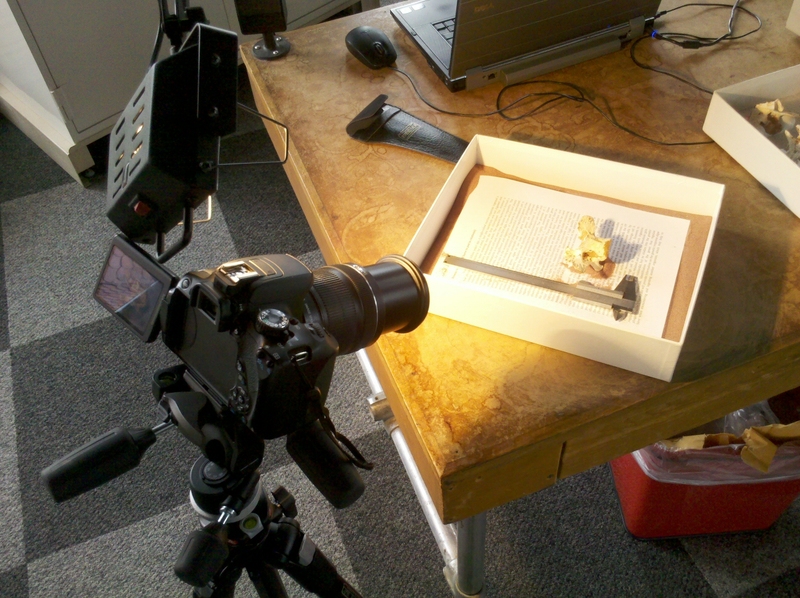 Tail vertebra of Ingenia in sandbox, with camera set up for photogrammetry shoot. Photo taken in Mark Norell’s famous office in the AMNH. What’s that sheet of paper doing in there, Padawan? An important step is now aligning the camera so that it points at the centre of the turntable, or at a spot vertically above it. 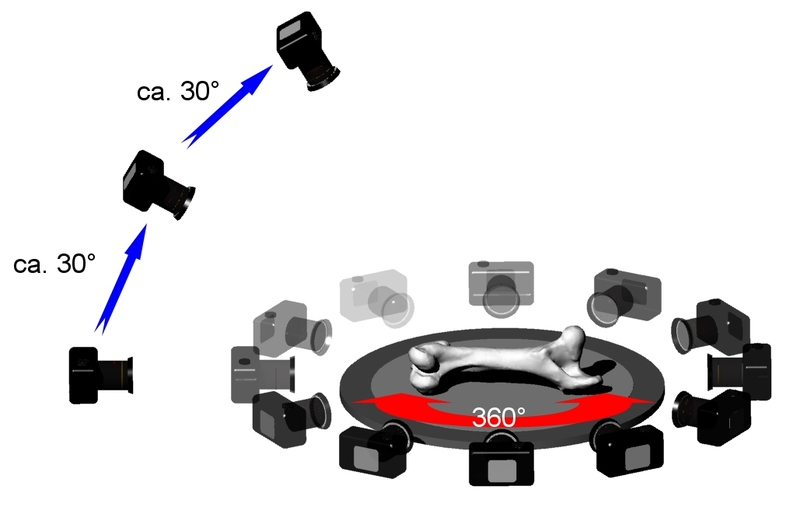 Otherwise, the specimen will “wobble” in relation to the camera when you turn the table. Also, make sure your specimen is centred on the turntable, for the same reason. Now play with the distance of the camera from the specimen and the focal length of your lens. You should avoid extreme lengths; stay close to 50 mm if you can. If you can’t ensure that the specimen and camera are well aligned, for example if you have a very long and narrow object, you are often better off using a far-away position of the tripod and playing with the focal length than moving the tripod between shots. Here, the rotatable screen on my camera comes in again, the one I keep harping on about. No need to crouch behind the camera so judge if the specimen fills the view nicely! You can simply twist the screen so that you can see well from a standing position, or even sitting down next to it. There’s an added advantage, too, to which I will come in a moment. Next, flip your specimen over! If you want to get a digital model that covers the whole surface, you need to capture that part currently in contact with the turntable as well. Also, there will be huge holes on the underside of the model, although you may well be able to see most of the surface. That’s because you can’t light these parts very well, and because you can only get photos of the underside at a very shallow angle. So test how it rests in various positions, then choose two (or three if you have to) that give you good access to all parts of the surface. Usually, it’s easy, but sauropod ulnae, for example, do not work both ways, but prefer to go three-ways 😉 So you need to either be very careful how you place them, or take three sets of photos. So, all set to take photos? No! Now you need to consider the lighting, too. In the example above I used a simple studio lamp, but you may need to find more elaborate means. So, let’s talk about lighting for a moment. The ideal light for photogrammetry lights each and every piece of surface on your specimen completely equally. And brightly, but not so much that you get reflections, for example on somewhat shiny specimens that have been covered with lacquer. And that’s exactly what all collections rooms in museums world-wide will offer you – NOT! Usually, the biggest problem is not the light, but the lack of the same: collection rooms tend to be sufficiently lit to find specimens, but rarely to study them. That’s what the small lamps on the tables shoved into corners are for, on which you are allowed to work. And such lamps are usually not suitable for lighting specimens for photogrammetry. On the other hand, sometimes conditions are a lot better than one may be inclined to think initially. 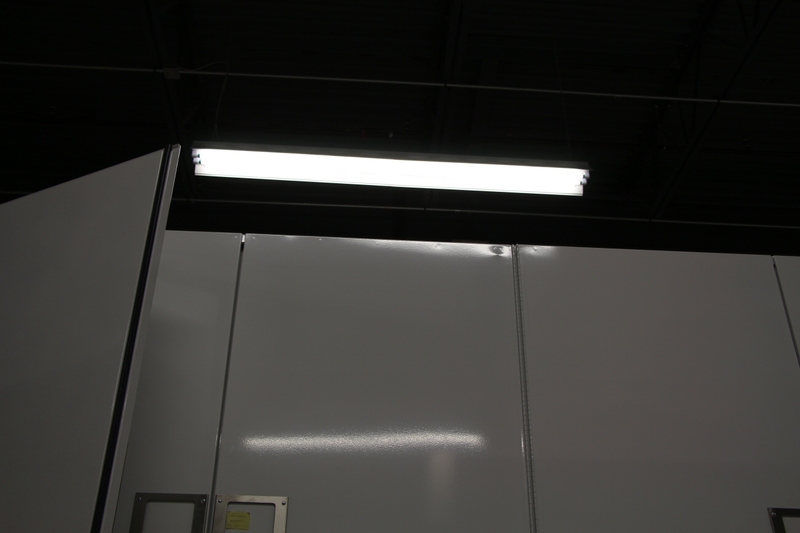 Check out this photo of a typical collection room situation: cabinets and fluorescent lights. This is, in fact, not half bad! The white, smooth cabinets throw back a lot of light, which comes at a specimen placed between them at a shallower angle than the direct light from the light fixtures dangling from the ceiling. That means less shadowy undersides! And the fluorescent lights are decently long, so that they do not form a point source of light, but cover an arc. And if there are, as in the room the above photo was taken in, lights in rows, you get a fairly even lighting of a specimen you place smack in the middle. So do not be afraid to ask curators and collection managers for space where the light is best, but do expect the need to supplement them with additional light sources (a later post will have some info on how to do that). But remember: long exposure times, as enabled by the use of a tripod, can make up for darkness! They can not even out lighting very much! 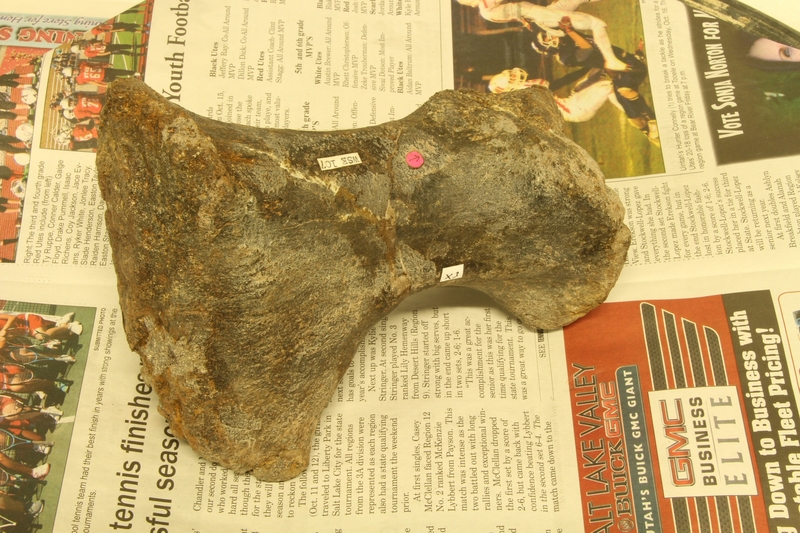 Thus, better darker and evenly lit, than having spotlights on parts of the specimen. So, once you have the light you need, are you all set to shoot? Nope! You need to add something to the scene, or your model will be a limited usability. That something is a scale object. Something that will come out in the 3D model and has a feature of exactly known length, so that you can scale your model correctly. You can place a calliper on the turntable, a scale bar, you can add a business card, whatever! Ideally, you use something big, because there will be a measuring error. The larger the distance, the less the proportional influence of the error. So, now finally ready to rock&roll? Theoretically, yes! But there is the issue looming over your work how you are going to combine the models you get from your several sets of photos into one 3D file! How can you register scans or photos sets? on points on the background. For 1., you can simply take your photos. When you throw them into your photogrammetry program, you can simply toss all photos into one batch. Now, you must mask the background, including the turntable, on all photos! Otherwise, points for alignment will be found there, and will turn out to be very powerful – after all, points on the background will be on ALL photos, because your camera doesn’t move versus the room. If you’re really lucky, the background will be so out of focus that masking is not necessary, thus it doesn’t hurt to run a very quick&dirty alignment to check. But that’s rare, so you should plan in some time for masking. The advantage of this method is that it can be very quick and accurate. The downside is a high risk of failure (there may be too few points on the overlap), and the likely demand for time-consuming masking. For 2., you will need to add at the very least three points. That means sticking tiny pieces of paper with an ‘x’ on them to the specimen, ideally with a number scribbled next to the mark. That way you can more easily identify the marks on your photos. More points mean you’re covering up more of the specimen, but it makes the registration easier and better. Also, you must make sure the marks do not shift, or fall off, when you move the specimen. And remember, they have to be visible is both sets of photos! The advantage is a rather speedy alignment process, the downside that your model will have white spots, and that adding very many points for a very high accuracy alignment costs a lot of time. Lastly, for method 3., you’re limited to points on that part of the background that moves WITH the specimen. Essentially, stuff that’s also on the turntable. That stuff will also help with aligning the photos of each set to each other, increasing the quality of each batch or chunk, so this approach sounds like a good idea. As you can see in the photos above, I used printed paper as a background even with a turntable. However, the enormous drawback is that you must ensure that the points move with the specimen when you flip it over! Ouch! This essentially limits the method to small specimens that you can fixate in some way to a scaffolding that also carries the points for alignment. Doing this without hiding some part of the specimen is near-impossible, so it is a last resort. I cropped these parts of the photos out for my two cases shown above, and opted for method 2! So, NOW you can take your photos! But how? First, raise the camera so that it looks at the specimen side-on, or slightly higher. Then, take a photo, turn the turntable 5 or 10°, take the next photo. If you have a camera with a touch screen or a remote-control release, use it! Touch screen release means you can easily control which point the camera should focus on, and jiggles the cam a lot less than the manual shutter release. A remote is nice, too, because it avoids jiggling, but you still have to adjust the focus point (if necessary) manually. Once you’ve gone all around the specimen, raise the camera so that it points down at the specimen at a ~30° angle. Now, take another round of photos. Next, decide: is the specimen rather flat and you have already captured the entire surface well? Then you may already be done. If not, raise the camera further and take another set of photos. A question I get asked regularly in this context is: “Why do you not need to take photos from the top down?” The answer is fairly simple. Your object will typically rest well on a turntable with its flatter sides down (and up). Therefore, two or three sets of photos at shallow to intermediate angles will suffice to cover the top. Only if there are deep recesses on top will you need to take top-down photos – and then one or two will suffice! The key to good photogrammetry is to MOVE the camera between photos, and “move” in this context means a 2D or 3D-displacement, not just a rotation around the long axis of the lens. Afterwards, there are still things to do right away, before you can throw your photos into the photogrammetry software of your choosing. Mainly, checking photos – did they come out ok? Did you follow the protocol, or did you mess up? I didn’t check my AMNH photos in time, and now have photo sets of two verts only from one side each. oops! Also, you will need to sort your photos: which photos show which specimen from which side? There are two tricks for making this task easier. First, you can start each series of a specimen with a photograph of the specimen label. In between the first and second series (i.e. when I flip the specimen over) I always take a photo of “nothing” – my hand, or I tilt the tripod and photograph the ceiling. When you now look at the photos in the explorer view, using medium-sides thumbnails, the start of each specimen will stand out optically (label photo), as will the break between the series. This entry was posted in Digitizing, photogrammetry. Bookmark the permalink.